George Pratt Shultz a labor and economics specialist, educator, author, businessman, and international negotiator, served under three U.S. presidents. He was the first director of the Office of Manpower and Budget and served as secretary of the Department of Labor, of the Department of the Treasury, and of the Department of State. George P. Shultz was born in New York City on December 13, 1920, the only child of Birl E. and Margaret Lennox (Pratt) Shultz. He spent his childhood in Englewood, New Jersey, and attended private school in Windsor, Connecticut. He majored in economics at Princeton University, where he received a B.A. degree in 1942. During World War II he joined the United States Marine Corps, served in the Pacific arena, and advanced to the rank of captain. While in Hawaii he met Helena Maria O'Brien, an Army nurse. They were married on February 16, 1946, and had three daughters and two sons. Shultz resumed his academic career by enrolling at the Massachusetts Institute of Technology in 1945. He earned his Ph.D. degree in 1949 within the program of industrial economics, specializing in the problems of labor relations, employment, and unemployment. Shultz stayed on at the university until 1957 to teach industrial relations. During this time period he began to serve on arbitration panels for labor-management conflicts, a role he was to enact many times over the next decade. He also served at the first of his many national government posts when he was appointed senior staff economist to President Dwight Eisenhower's Council of Economic Advisors. In 1957 Shultz joined the University of Chicago Gruate School of Business, where he also taught industrial relations. He became dean of the school in 1962. Presidents John Kennedy and Lyndon Johnson appointed him to serve on several government task forces and committees related to labor-management and employment policies. President Richard Nixon named Shultz to the post of secretary of labor on December 11, 1968. Although he advocated that the government not intervene in labor bargaining or strikes, circumstances thrust the secretary into many such disputes. One major crisis that forced his attention was the 1970 postal workers strike, which required sending the National Guard into New York City to sort the mail. During his term in office Shultz defended the Nixon administration's reluctance to pursue affirmative action programs aggressively and the administration's active campaign on union reform. He worked hard to keep wages from rising in both the private and public sectors. After 18 months at the Labor Department, he accepted President Nixon's appointment to become the first director of the Office of Management and Budget (which replaced the Bureau of the Budget in a major administrative reorganization). In this position he continued to face problems of wage control and price freezes, as well as major private industry strikes. In May 1972 Shultz again changed posts in the Nixon administration. He was appointed secretary of the treasury, where he became a key adviser to the president on matters of the federal debt and both domestic and international economic policies. On the domestic front, Shultz was involved in efforts to defeat the rising inflation of the early 1970s. On the international side, he travelled abroad many times to negotiate a multi-national "floating" currency system with exchange rates set by the marketplace and several trade agreements with the former Soviet Union (now the Russian Federation, comprised of 21 autonomous republics, 49 oblasts, and 6 krays). When the Organization of Petroleum Exporting Countries (OPEC) drastically increased oil prices after October 1973, causing rapid inflation, Shultz's call for an international rollback of prices went unheeded and he worked hard to stop the recession in the American economy. 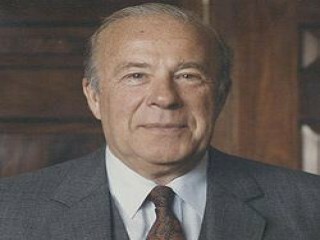 Shultz resigned from government service in March 1974 and entered the business community. He became an executive vice president of the Bechtel Corporation, an international construction and engineering firm based in San Francisco. He later became president and a director of the Bechtel Group, Inc. Nominated as the 60th secretary of state by President Ronald Reagan, Shultz was sworn in on July 16, 1982. As the nation's major adviser and negotiator of international affairs, Shultz was intimately involved with the important problems of the world. He sought plans to end conflicts in the Middle East and in Central America and to deal with international terrorism. As a member of the president's team, he supported a strong American defense program, including a space-based anti-missile defense system (the Strategic Defense Initiative, or Star Wars). He guided U.S. arms limitation talks with the Soviet Union. A constant international traveller, he attended President Reagan's meetings with Soviet leaders. His academic and labor arbitration background molded his approach to his work as secretary of state. He proved to be a thoughtful and careful operator and a firm believer in quiet diplomacy. He served as Secretary of State from 1982 to 1989, at which time he returned to the private sector as an educator (Stanford University's Hoover Institute and Graduate School of Business) and writer. His entire cabinet service spanned over twelve years and covered four separate cabinet posts (Secretary of State, Secretary of Labor, Secretary of Treasury, and Director of OMB.) He maintained a residence in Stanford, California. Shultz authored a semi-autobiographical novel, Turmoil and Triumph: My Years as Secretary of State (1993), which was well reviewed. Accounts of his career during President Nixon's administration are in Dan Rather and Gary Paul Gates, The Palace Guard (1974) and in William Safire, Before the Fall (1975). View the full website biography of George Pratt Shultz.